WIN #53: 1 of 2 Brush-Baby Chewable Toothbrush and Teether! 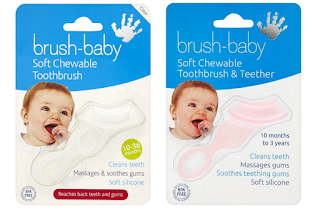 Win a Chewable Toothbrush and Teether worth £4.99 from Brush-Baby! Brush-Baby was inspired by Dominique Tillen's little girl who chewed her toothbrush. With a sister for a dentist, Dominique was well aware how important it was to keep her little girl's baby teeth clean, and her gums healthy, but tooth-brushing time could be a real battle! Dominique's little girl would chew on her toothbrush, if Dominique could get it into her mouth at all! So Dominique created her first product, the Brush-Baby Chewable Toothbrush, known as the Brush-Baby, it was an immediate success and is now sold worldwide! Brush-Baby have now gone on to develop a range of dental-care product with babies, toddlers and young children in mind. The Chewable Toothbrush and Teether is perfect for teething toddlers and those who won't brush their teeth! The award winning silicone brush helps clean teeth and gums, whilst also soothing the teething gum whilst being chewed. Recently featured on ITV1's This Morning programme, it can be used with or without toothpaste for cleaning teeth. 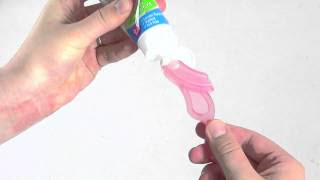 The product can be cooled in the fridge, or used with teething gel to soothe teething gums. Suitable for ages 10 months to 3 years! It's unique shape fits little mouth correctly and reaches molar teeth (back teeth) and gums. Brush-Baby's Chewable Toothbrush is made of the highest grade medical silicone so you know it's safe for your toddler to chew on. Dishwasher and steriliser safe up to 180 degrees and BPA free! I have two Chewable Toothbrushes's to give away to two lucky winners! One in pink and one in clear, unfortunately I am unable to favour colours for the winners in case of the same choice being selected! Please note: You must at least follow or like Unique Young Mum and Brush-Baby on at least one social media platform! To find out more about Brush-Baby, and to view their full range of products, check out the official website here.